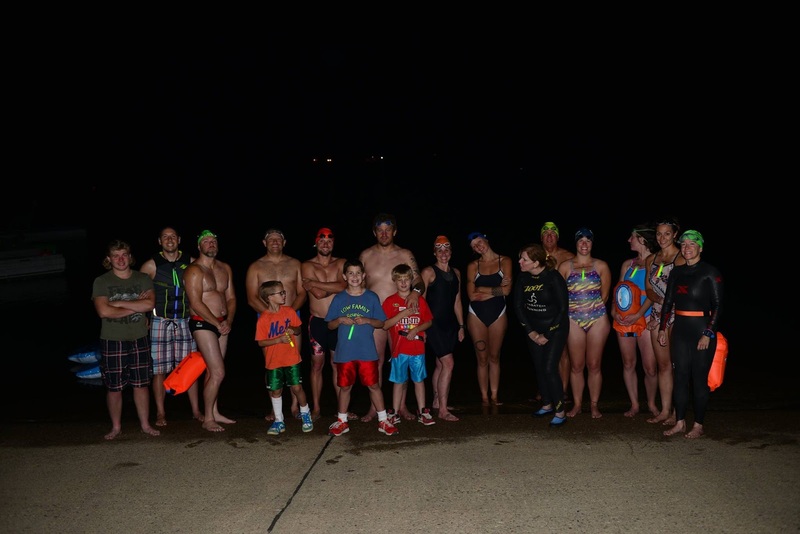 We had a good turnout for the Blue Moon Swim at Jordanelle last Friday. Photo by Jim Hubbard. A couple months ago, I was talking to Sue about doing a full moon swim. We looked at the calendar and the best date seemed to be July 31st because it was a Friday. I had no idea until the day of the swim that it was not only a full moon, but a blue moon. I had heard the phrase "once in a blue moon" but wasn't sure what a "blue moon" was. I found out that it doesn't have anything to do with the color, but is the second full moon in the same month. Will Reeves and Jeremy Clark met me at my house and we drove up together. When we got there, there were a few other people waiting around. Goody was in the water swimming already. We unloaded my paddleboard and everyone started getting ready and putting on glow sticks. I had been sick all week and planned to just support the swim on the paddleboard instead of swim. Will Reeves, Jeremy Clark, and myself getting ready to swim. Photo by Jim Hubbard. We had about 15 people show up to swim, which was the biggest group we have had for a night swim. After taking some pictures and a brief safety briefing by Goody, I went out in front of the group to guide everyone to the end of the buoy line. Even though the moon was out and was really bright, it was hard to see the buoys on the way out. It was a beautiful night to be on the water. I just watched the bobbing glow sticks and listened to the splashing of the swimmers strokes. Coming back, it was much easier to see the buoys. When we got to the end of the line, I left a glow stick on the buoy so that everyone else would know where to turn around. It was fun to hear people stop every once in a while and say "this is so cool!". When we got back to the ramp, I wanted to get in the water for just a minute. I ran down the dock and jumped in. I only swam out to the red and green buoys and back, not wanting to make my cold any worse. The water felt good and was 68 degrees. We ended up with three paddlers on the water and were able to keep track of everyone. It was a lot of fun and I look forward to doing it again next year.